It is only a decade ago that the eighteenth-century distinction between civil society and the state seemed old-fashioned, an object of cynicism, even of outright hostility. In this important new book, John Keane shows how, in a wholly unexpected reversal of fortunes, this antiquated distinction has since become voguish among politicians, academics, journalists, business leaders, relief agencies and citizens' organizations. John Keane examines the various sources and phases of the dramatic world-wide popularization of the term. He traces its reappearance in a wide range of contexts - from China to Tunisia, from South Africa to the emerging European Union - and clarifies the conflicting grammars and vocabularies of the language of civil society. Considerable care is taken to highlight the different possible meanings of the distinction between civil society and the state. 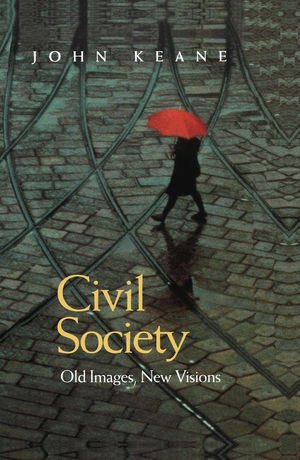 Keane also takes the reader into previously uncharted intellectual territory by demonstrating that the civil society perspective contains unharnessed potentials: that it is possible to develop bold new images of civil society that alter the ways in which we think about matters such as power, property, violence, politics, publicity and democracy. Written with style and imagination, this important book by John Keane will be of great interest to students and scholars in politics, media studies, sociology, social and political theory, and to a broader public audience interested in the central debates and political developments of our time. John Keane is Professor of Politics at the University of Westminster and Director of the Centre for the Study of Democracy. * Important new book about civil society by one of the leading scholars in politics and political theory today. * Examines the world-wide popularisation of the term 'civil society' and examines some of the key issues and debates associated with the distinction between civil society and the state. * Demonstrates the relevance of the concept of civil society in relation to issues of great interest today - such as nationalism, ethnic conflict, the media and the public sphere.